Corfu or Kerkyra (Greek: Κέρκυρα) is a beautiful island in the Ionian Sea, which —together with its small satellite islets— forms the north-westernmost part of Greece. It is the second largest member of the Heptanese islands (the largest being Kefalonia) and it has a population of 102,072 inhabitants, as of 2011. 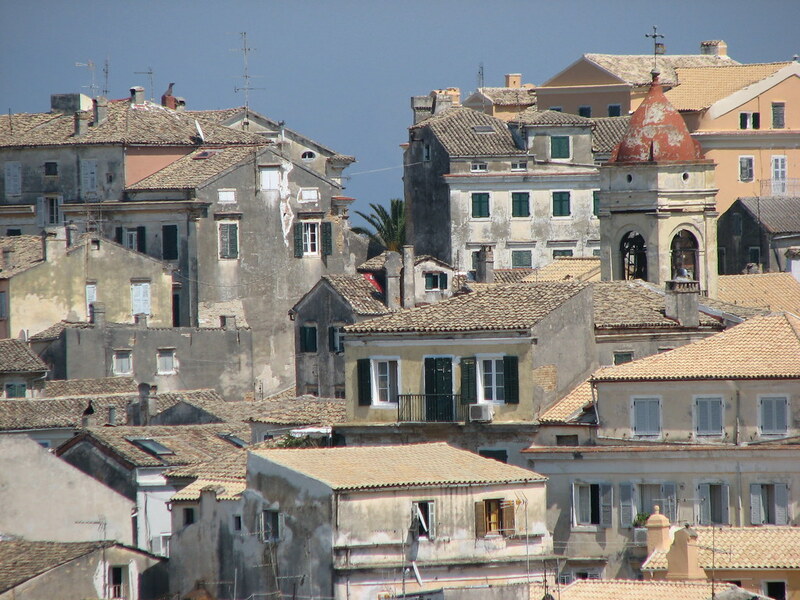 Its capital city is also called Corfu and it has a population of 39,487 inhabitants. Corfu lies opposite the prefecture of Epirus in mainland Greece and approximately 2.5 hours from the city of Ioannina. It is believed that Corfu is the island of Phaiakes (or Phaeacians), mentioned in Homer’s Odyssey, which was the last stop of Ulysses before finally returning to Ithaca. The old town of Corfu with the old buildings and the narrow cobblestone passages (known as “cantounia”) is one of the most picturesque places in Greece and it has been inscribed in UNESCO’s World Heritage List. The medieval style of its town, the vast green and the charming beaches and natural bays make Corfu a uniquely beautiful island and a particularly attractive holiday destination. The Pontikonisi islet is probably Corfu’s most well-known landmark. It is in fact a beautiful green islet, which can be visited by boat from the city of Corfu. According to the legend, Pontikonisi was once the boat of Ulysses, which, during a tempest, was transformed to an islet by the god of the sea, Poseidon. Today it hosts the monastery of Pantokratoras and it offers an amazing view. The Liston is a quarter in the centre of Corfu, where one can enjoy a drink or meal in one of the numerous cafes and restaurants found in the quarter or simply enjoy a nice stroll in what is probably the most cosmopolitan place in Corfu. The Liston was designed based on the famous Parisian street, Rue de Rivoli, in the beginning of the nineteenth century, while the island was under the French rule. Its designer was the French engineer Mathieu de Lesseps, whose son, Ferdinand, later designed the Suez Canal. Kanoni, situated in the homonymous peninsula, is a place that offers a breathtaking view to the rocky islet of Vlacherna —to which it is connected through a causeway— and Pontikonisi. The central square of Corfu, Spianada, located opposite the old fortress, is one of the largest squares in Greece and it is the centre of most social activities and events on the island. The Mon Repos palace was built for the English Commissioner Thomas Maintland and his Greek wife, Nina Palatianou. The palace housed the School of Fine Arts and later became the temporary residence of Empress Elisabeth of Austria (AD 1863). Today, Mon Repos is property of the Greek State and hosts an archaeological museum with findings from the excavation in the region of Palaiopoli. The Achilleion Palace was built in 1890 for the Empress of Austria, Elisabeth of Bavaria, also known as Sisi. The palace was designed having the mythical hero Achilles as its central theme and his statues as Guardian Achilles and Dying Achilles can be seen in the palace’s gardens. The church of Aghios Spyridon is one of the most important post-Byzantine monuments in Corfu. Its impressive tower-like steeple resembles that of the church of San Giorgio dei Greci in Venice, which was built during the same period. The old fortress, Palaio Frourio (or Fortezza), was built with the aim to embrace and protect the new city, which was built after the sixth century AD, when the old town located in the region of Kanoni was destroyed by invaders. The new fortress, Neo Frourio (or Fortezza Nuova), was built during the period 1576–1645 under the Venetian rule, as the old fortress could no longer protect the island from invaders. The Byzantine castle, Angelokastro, is thought to be built around the fifth or sixth century AD and it strategically stands until today at the top of a steep cliff (elevation: 305 metres) and overlooks the city of Corfu, the sea and the mountains of mainland Greece. Its design and construction at this forbidding position is admirable by medieval and even modern standards. Easter in Corfu is a special celebration with unique traditions and events taking place, such as the representation of the earthquake that was believed to have taken place after the resurrection of Jesus, the litany dedicated to Aghios Spyridon and the epitaph procession dedicated to Jesus, and finally the “war of jars” in the narrow streets of the old town. On the 6th of August every year, the monastery Metamorphosi tou Sotiros located on the Pontikonisi islet celebrates and it is a great opportunity to visit the islet. Pastitsada, is a traditional dish of Corfu prepared with veal braised in wine and tomato sauce and accompanied by a Greek type of pasta that resembles the Italian bucatini. Bourdeto is a delicious plate of Corfu made with fresh fish, usually red scorpionfish, cooked in tomato sauce. Kumquat is a citrus tree that thrives in Corfu and its fruits are used in preserves, as well as for the preparation of the famous and very special sweet liquor of Corfu. Tsitsibira is a type of fizzy drink that resembles ginger beer and it is made with lemon juice, ground ginger, lemon essential oil, sugar and raisins. Mandoles is a type of sweet made with caramelised almonds. Mandolato is type of nougat, made with almonds, egg whites, honey, sugar and vanilla. Pasteli is a delicious and quite healthy sweet made with sesame seeds and honey or sugar, but it is often made with almonds too. The blue markers shows the location of various accommodations in Corfu. The letter in the marker describes the accommodation types: H for Hotel, A for Apartment, R for Resort, B for Bed & Breakfast and O for Other (e.g. pension, villa). Click on the blue marker for more information on the accommodation.